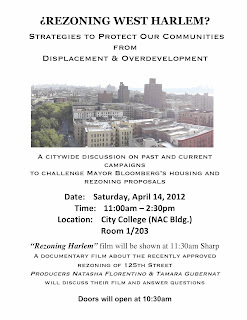 follows longtime members of the Harlem community as they fight a 2008 rezoning that threatens to erase the history and culture of their legendary neighborhood and replace it with luxury housing, offices, and big-box retail. A shocking exposé of how a group of ordinary citizens, passionate about the future of their treasured community, are systematically shut out of the city’s decision-making process, revealing New York City’s broken public review system. This film provides a behind the scenes view of how policy affects gentrification, resulting in homogenous neighborhoods devoid of character. to place your credit card or PayPal order. to Third World Newsreel, 545 8th Avenue, 10th Floor, New York, NY 10018. We accept institutional purchase orders, checks, money orders, credit cards and PayPal accounts. Remember to add $20 for shipping and handling. 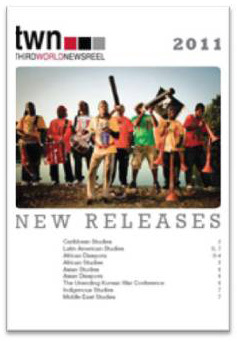 TWN’s new catalog is available online! Featuring thirteen independent films made by and about people of color, our new catalog includes titles from Haiti, Brazil, South Africa, the Democratic Republic of Congo, Uganda, China, Turkey and the United States. Click the link below to download the PDF version. The story of one small business in East Harlem dealing with gentrification and rising rents that makes it to WPIX. 18 people injured in building collapse on 125th St.
CBS video of the collapse of a building being demolished on 125th/St. Nicholas. DNAInfo reports that the plan to preserve the facade and elements of the Victoria Theater and built two new towers is scheduled to break ground next year. The New York Times reports on the details of the plans to redevelop the Victoria Theater site and other new building projects stirring on 125th Street. 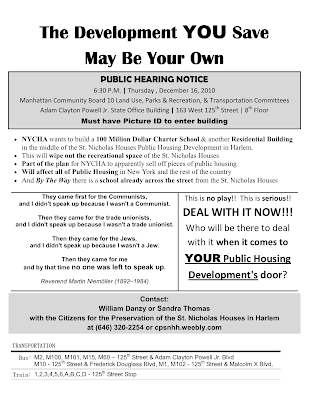 A Charter School in St. Nicholas Houses? The most current renderings of Bruce Ratners arena show strips of waist-high, metal, security bollards, raising questions over whether the security structure will end up looking similar to the large granite blocks recently placed outside the LIRR station. To read that story click here: http://gothamist.com/2010/01/06/the_new_long_island_rail.php. The Empire State Development Corporation is keeping security plans for Atlantic Yards a secret, violating the Freedom of Inorfmation Law. The ESCD is a public agency and the new security measures could drastically affect the external aesthetic of the building. According to the Architects Newspaper Blog, the Bloomberg Admin has recently released a study called the “New York City Community Air Survey,“ turning out to be one of the most comprehensive studies of the city’s air quality ever taken. Ironically, some of the most polluted areas are located outside of Manhattan, along expressways built by Bloomberg himself. The area around the Atlantic Yards site has already shown to be one of the more congested areas, and as more blocks begin to close and traffic grows heavier around the area, it is predicted that the air quality will become even worse. The Pacific Dean Homeless Shelter, located in Prospect Hight Brooklyn, will be closing next week to make way for apartment towers which won’t be developed for several years. In the meantime the space will be used to store construction vehicles. Approximately 80 families currently reside in the shelter. According to the Department of Homeless Services most of the families have been placed into permanent housing with the remaining families to be placed in alternative shelters. Also Check out This Article About Who Has the Authority to Deem an Area as "Blighted"
Why the Blight Study is a Pertinent Step For Eminent Domain in the Columbia U Expansion. On December 22nd, Manhattan Supreme Court Judge Emily Goodman ordered a temporary restraining order on the development of the 31-acre Brooklyn Triangle site. The plan was set to allow for 1,851 units of housing, 800 of which were to be set aside for low to moderate income families. However, the project has remained controversial since its outset with community groups claiming that the rezoning had led to the discrimination and exclusion of minority groups. As with many of the current rezonings taking place all over our city, much of the decision-making has been kept secretive and remains in the hands of wealthy and well-connected corporations. It is a big step that the courts are finally starting to recognize the injustices that have happened and force the development corporations to be more responsible. 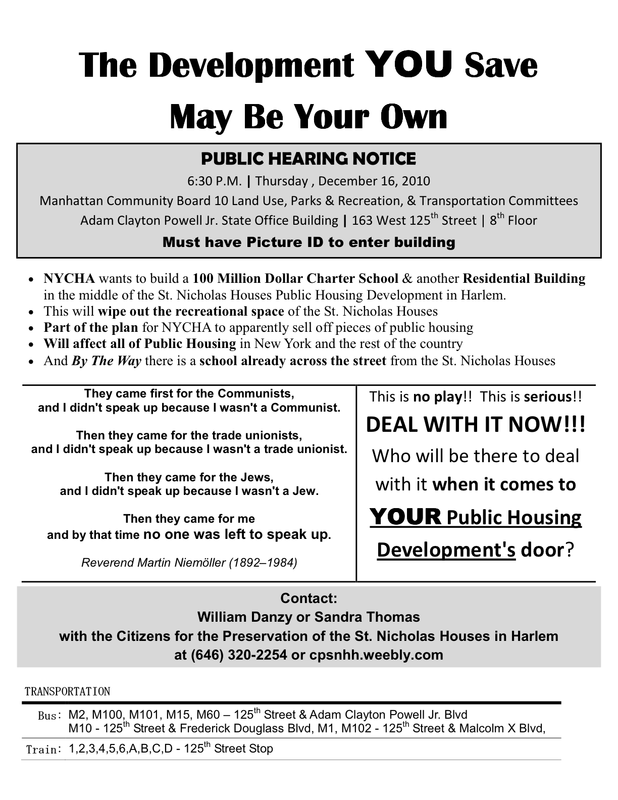 Call your City Council Members and thank them for opposing a development deal that was bad for the Bronx and NYC! Don’t let the Mayor override this historic City Council decision which could pave the way for responsible development in NYC. Ask to speak with Ramon Martinez or ask to leave a message for the speaker. Ask to Speak to Annabel Palma or to Megan Lynch, her Chief of Staff or Jeffrey Lauffer, her legislative aide.